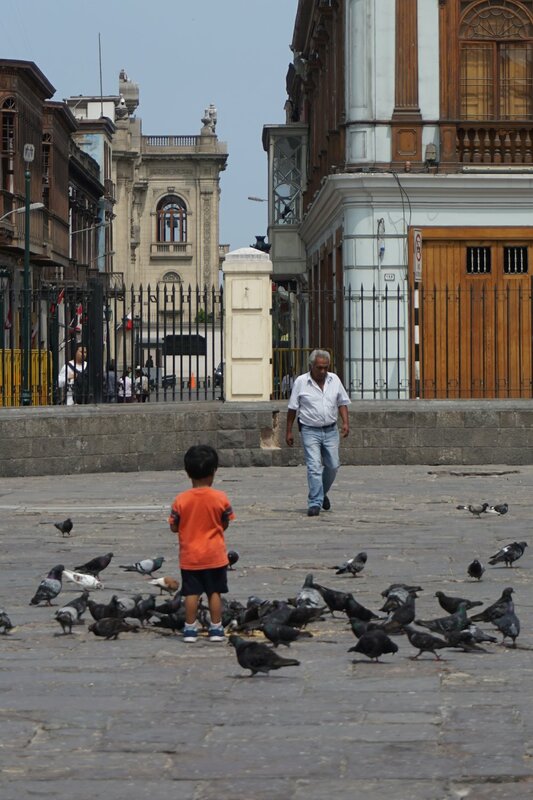 We started with a couple of days in Lima, Perú's capital and home to some 11 million people. It was indescribably dense with cars, people and development, but it was somehow easy to quickly fall into its intense rhythm. We stayed in the Miraflores neighborhood the first night and in the city center, near the historic Plaza Mayor, the second night. 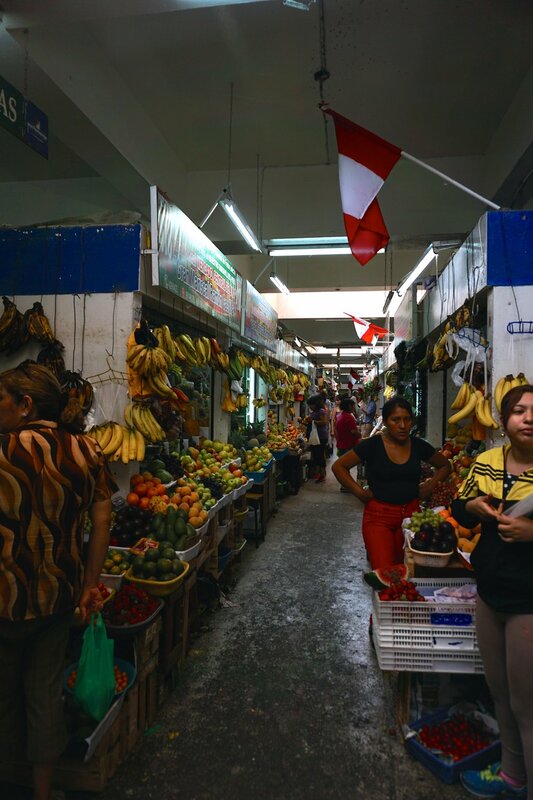 In Miraflores we visited the bustling main streets and learned to stealthily cross the street where cars do not yield to pedestrians, live animals or anything that moves. This skill would come in handy for the rest of the trip. We visited the Bioferia market of healthy and organic products and enjoyed a visit to Parque Kennedy. In the historic city center we found ourselves in the nucleus of unbelievable energy, noise and motion. It was the weekend and the Plaza Mayor had thousands of people in it, with at least half a dozen brides waiting for their ceremony or taking pre- and post-wedding photos near the cathedral. We attended portions of a couple of weddings and enjoyed riding the wave of happiness emanating through the open cathedral doors. Streets near the city center are closed to cars on Sundays -- a wonderful thing. But far from resulting in a reduction in noise, the streets were instead filled to the brim with music, people doing this and that, and various other noisy activity. At 3am we were abruptly awakened by metal rods and tables being strewn onto the street below us as a street fair was coming together. We learned that in Lima people seem to not sleep: they go to bed extremely late and wake up exceedingly early. 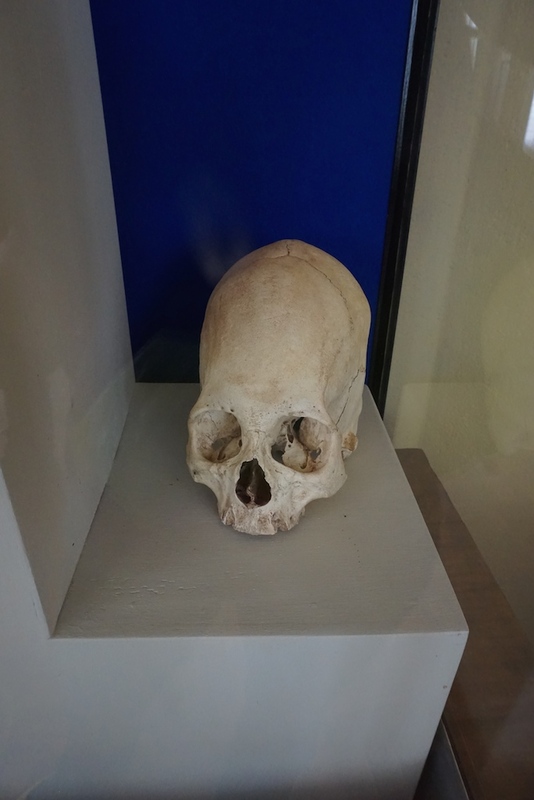 With little sleep, we visited the catacombs at the Basilica de San Francisco, where between 25,000 and 75,000 were buried before the city's cemetery was established in the early 19th century. The catacombs were built directly under the church, which is still in use today. During our visit, parishoners sang Simon and Garfunkel's "Sound of Silence" in Spanish inside the church. The sound traveled through small passageways in the brick and stone and was delivered eerily to our ears as we attempted to pay our respects to the neatly-stacked bones of long-gone Peruvians resting beneath the church. It was surreal to say the least. In Lima we had our first of many excellent Peruvian meals. 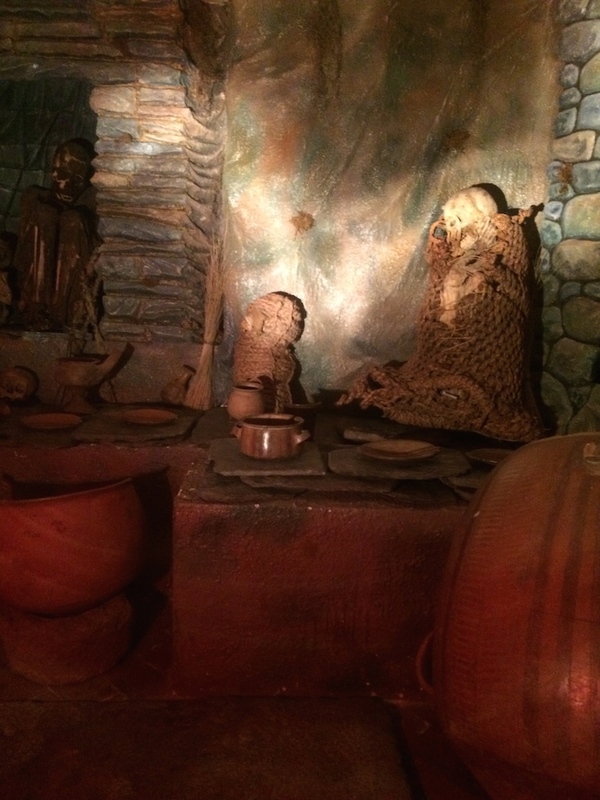 The best meal we had in the capital was at Mayta, in Miraflores. Lima was also the first of many places in Perú where we saw clear evidence of climate change, and where the vehicle emissions rendered the air so dirty it was sometimes literally painful to breathe. Speaking with several locals, we learned that the extreme heat the city was experiencing during our visit was not normal -- at least not until the last few years. The city is very humid, which makes the heat quite unbearable. Few shady or air-conditioned refuges exist, and the city (and country) are ill-equipped to respond to this growing challenge. A fruit vendor finding a shaded spot to sit on a hot day in Lima's Miraflores district. 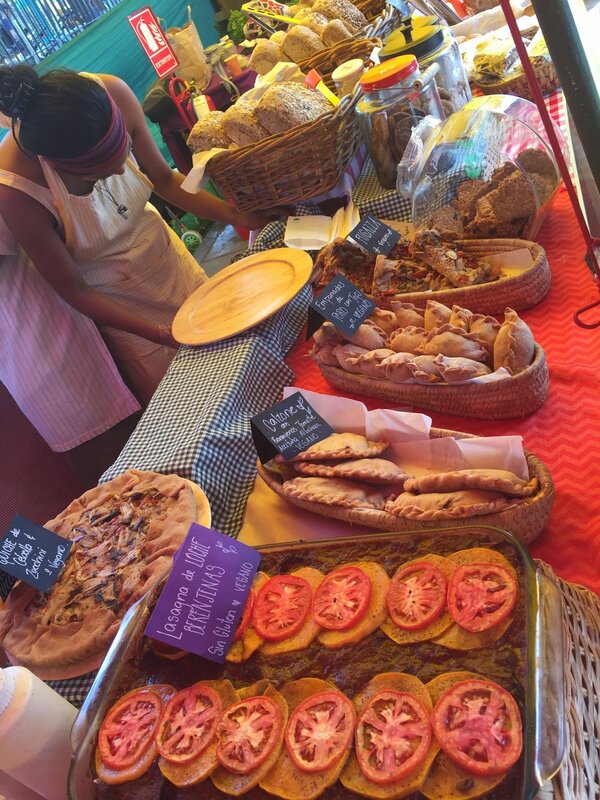 Vegan bakery stand at the Bioferia organic market in Miraflores district. The odd sight of a vendor dressed as a princess amid the hustle and bustle of Lima's central district. Manual delivery of a wide parcel requires sharing the street with cars where sidewalks are narrow and crowded. A lady unhappy that we snuck a photo in Lima's large central market. 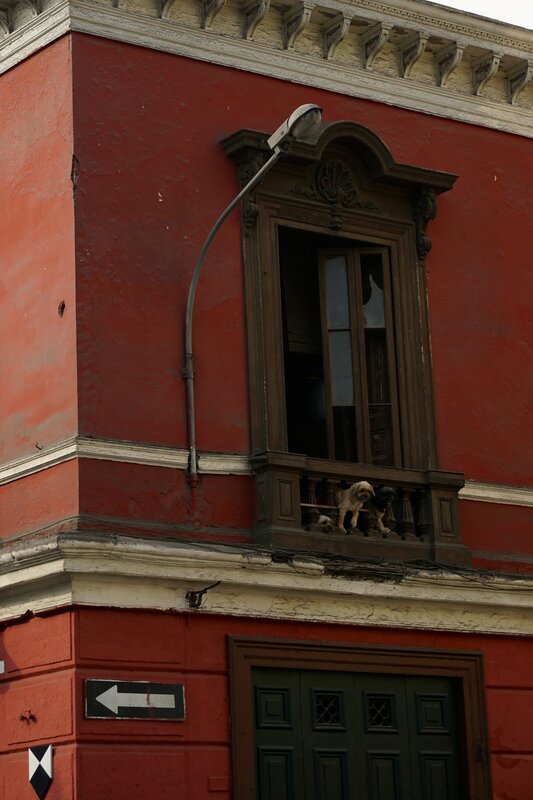 Three dogs in a balcony in Lima's historic core. The president's palace, steps away from the Plaza Mayor, where executions were held during the Inquisition. The guards must have been in a puddle of sweat underneath all those layers. Just steps from the Plaza Mayor, a view of Lima's slums and highway from a bridge above the Rio Rimac. One of the many weddings happening on a weekend evening in Lima's cathedral. From Lima we flew to Arequipa, known as la ciudad blanca for its widespread use of a white volcanic rock called sillar. 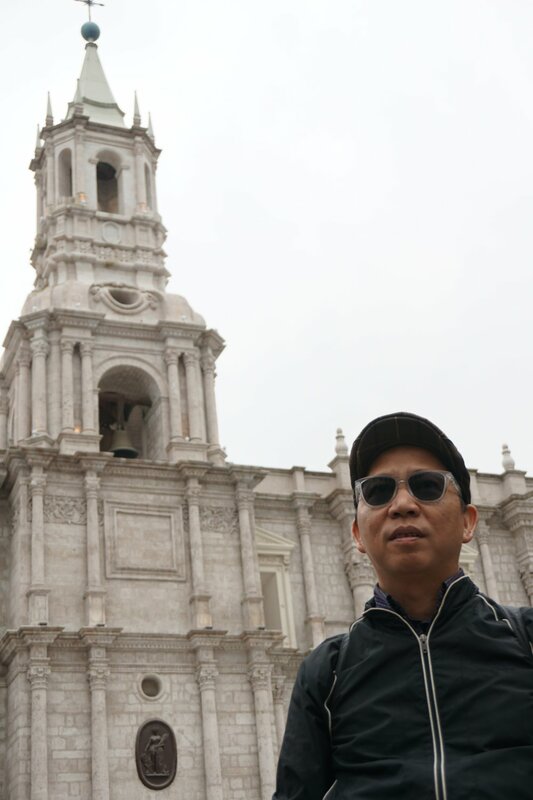 The city center is elegant and inviting, and its proportions are much more in line with the pedestrian experience than Lima -- despite Arequipa being the second most populous Peruvian city (after Lima). We stayed two nights just across from the famous and very lovely Monasterio de Santa Catalina. The monastery is a city within a city, comprised of hundreds of rooms and stand-alone buildings laid out around photogenic streets and plazas. Vibrant reds and blues and strong chiaroscuro from the play of sunlight and shadows contrast nicely with the geraniums and cacti planted thoughtfully throughout the massive property. It's a stunning place to visit. Arequipa was also the first of many Peruvian locations we experienced where people of all ages and sizes were forcefully hustling tourists. We didn't encounter this phenomenon to such an extent in Lima, even in the historic city center. Arequipa gave us the naysaying practice needed to get through the rest of the trip. While in Arequipa we booked a two-day trip to Colca Valley and Canyon, the deepest in the world and twice as deep as the Grand Canyon. 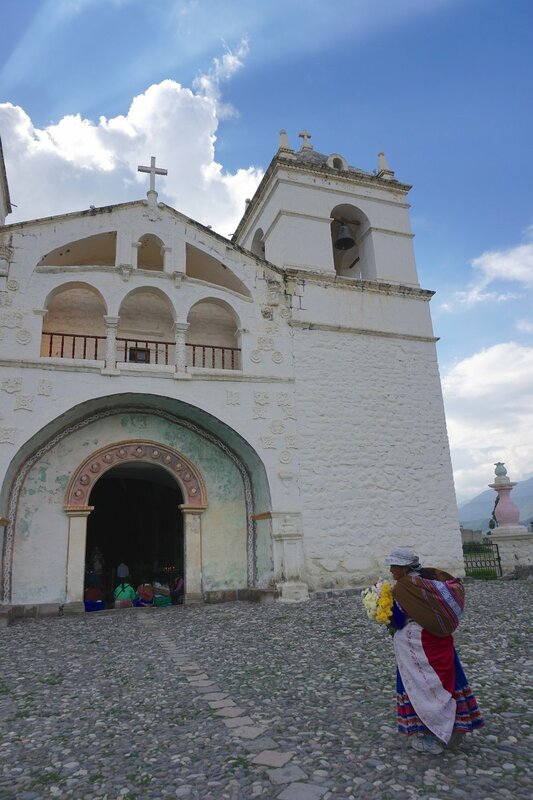 We chose the agency Colca Trek, which turned out to be an excellent decision. 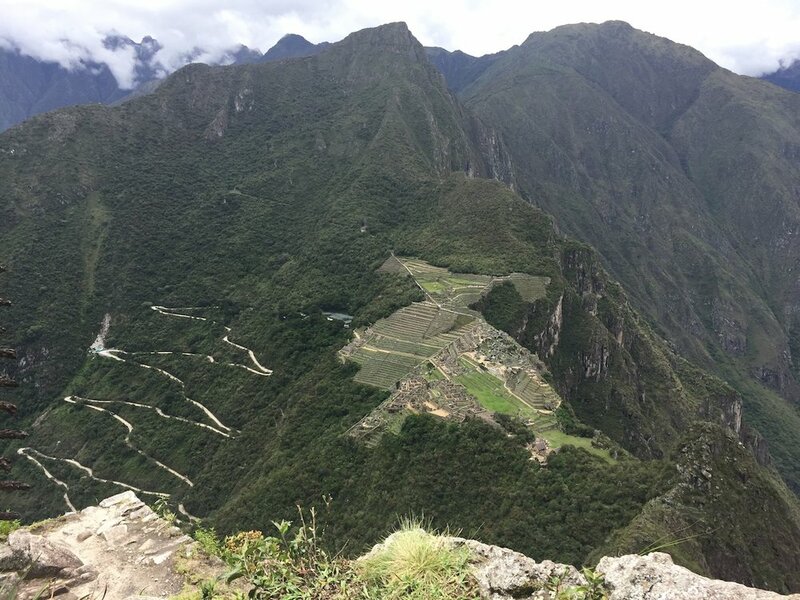 We were so pleased with the passion and care that our tour guide Sabino had as he shared details about the land, culture and people of Perú past and present. We were a group of nine, with five from Poland, Eddie and Michel from Holland, plus me and J. I was the only one in the group who spoke Spanish. As our driver Michy spoke no English, we developed a great rapport. Arequipa is said to be among the best places in Peru to buy hand-made alpaca wool items. We visited an artisan market and stocked up on gifts for family. We bought a couple of hats from this friendly vendor. Vicuñas and a distant volcano in the altiplano a couple of hours north of Arequipa. 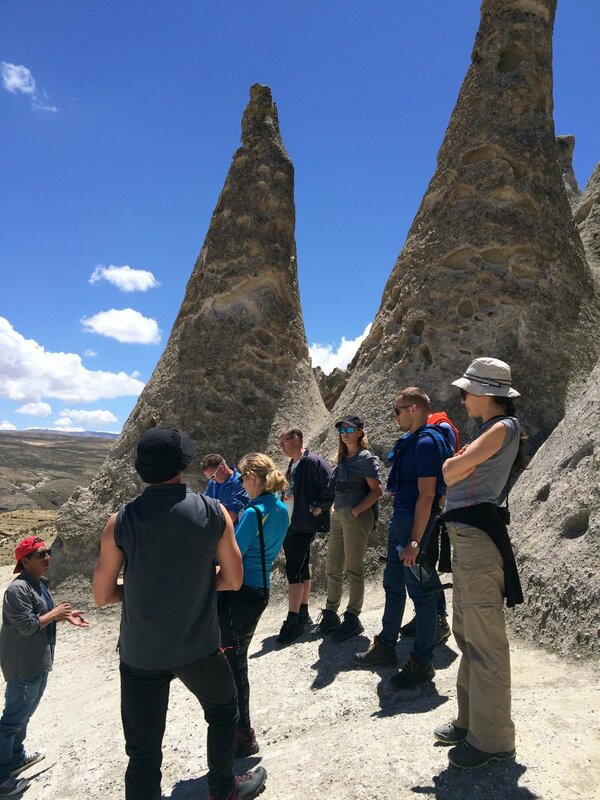 Jolly taking in the strange geologic formations at Salidas y Aguada Blanca National Reserve, known as Puruña to the locals. An infusion of coca leaves and other local herbs served at 15,000 feet to help with altitude sickness. The hut where we enjoyed said tea infusion. There were virtually no other structures for miles around. The lady who made our tea infusion (and sold us a wonderfully warm and lovely baby alpaca wool hat). 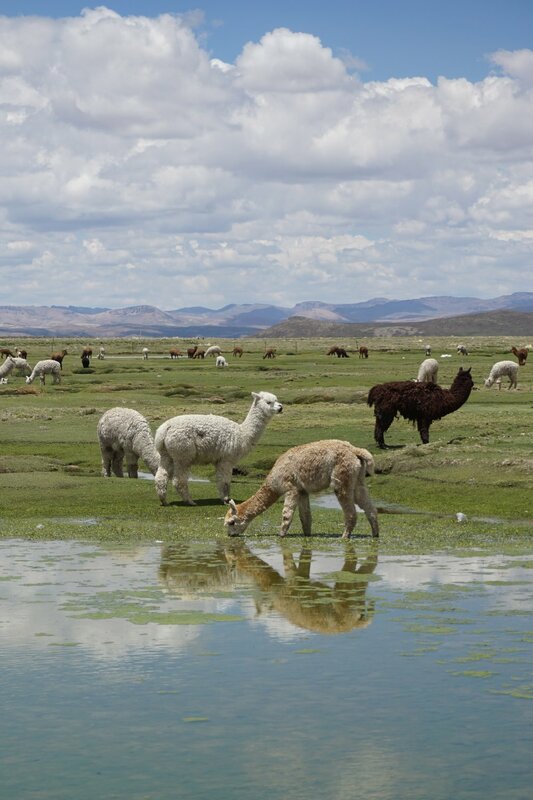 Native residents of the altiplano. Municipal water supplies are not to be trusted in Peru; bottled water is the way to go to prevent illness. Unfortunately, all that waste has to end up somewhere (here in the back of house in the altiplano, miles from anywhere). Villagers preparing for the celebration of the Fiesta de la Virgen de Candelaria in the town square of Maca. A resident of Maca getting a head start on the morrow's festivities, and trying to get E to partake of his alcoholic beverage. A few moments later we all broke out into a dance as locals played traditional music. The view from our room at Colca Trek Lodge. A victorious E holding electrolytes and antibiotics outside a pharmacy in Chivay, happy to begin curing an ailment you don't want to read about. 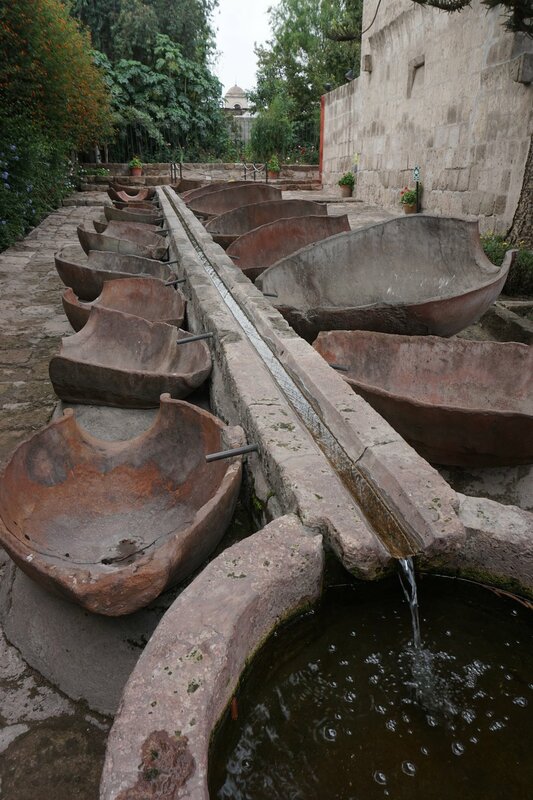 Hot springs at Yanque. Photo courtesy of our Polish friends and their GoPro. E condor-watching, dwarfed by a view into Colca Canyon -- the deepest canyon in the world. E, J and Sabino, our passionate Colca Trek guide. Stray dogs telling us who's boss in the village of Pinchollo, where Colca Trek Lodge is located. Cruz del Condor is apparently the best spot to see the massive Andean condors who call Colca Canyon home. We were fortunate to see several of these intimidatingly-large birds. After a beautiful two days -- which included hiking, bike riding and staying in a gorgeous lodge in the small village of Pinchollo -- Michy drove Eddie, Michel, J and me to Puno on the shore of Lake Titicaca, where the Fiesta de la Virgen de Candelaria was in full swing. I rode in the front seat of the van for much of the ride to chat with Michy, which proved an excellent opportunity to practice my Spanish and get into deep conversations about the nature of personality and whether we are each doomed to follow in our parents' footsteps -- among other engaging topics. The long drive included dramatic thunder and lightning all around us. It felt like we were in the middle of a National Geographic photo shoot! The next day Michy spent a few hours with me and J, using his agency discount to book a bus to Cusco on our behalf, as well as a tour of Lake Titicaca's Uros Islands. He was amazingly kind and insisted on giving us back the commission he received. He wouldn't take payment -- so we treated him to lunch and dinner and filled up the gas tank instead. Michy also drove us to the ruin of Sillustani, about 45 minutes from Puno. We gave a Quechua woman a ride and drove through several local villages. It was an unexpected treat, and by day's end we had forged a wonderful friendship with Michy, with whom we have continued to stay in touch. We said our goodbyes (I admit mine was a bit teary) and were off to a boat tour of the floating islands. Fascinating and beautiful as the islands were, our experience was marred by one of the several occasions of swindling we would come to experience in the country. Michy had helped us book a complete tour with a ride in a traditional vessel, but a firm handshake between Michy and the kid who sold us the tour wasn't enough to avoid a swindle. We ended up being told that our ticket didn't include the full tour after all -- but we were already on the second vessel when we were told. We were made to pay a second time despite me mustering the best Spanish-language argument I could -- complete with the statement "me estás estafando" -- or "you are swindling me." With one more swindle now behind us, we thought of the line from Annie Hall when Woody Allen's parents are arguing over the cleaning lady stealing from them and the father says "She's got a right to steal from us! After all, who is she gonna steal from if not us?" We were quite ready to leave Puno. The city itself is not particularly charming -- it's congested and run-down. We nevertheless enjoyed the festivities, which we found more celebratory on the eve of the Fiesta than on the big day itself (February 2). The town was alive with processions and street dancing and marching bands combining Western instruments with traditional ones. The folkloric flavor we had expected to encounter in the form of costumes was largely absent, however. Perhaps it was present on other days of the two-week celebration and we just missed it. We left Puno early on February 3rd. By this time we had developed a pattern of waking up very early, generally between 3:30 and 5am, and occasionally earlier! We took a tour bus on a 10.5-hour ride to Cusco with stops along the way including the Temple of Raqchi and the Museum of Inka Aymara de Pucara. 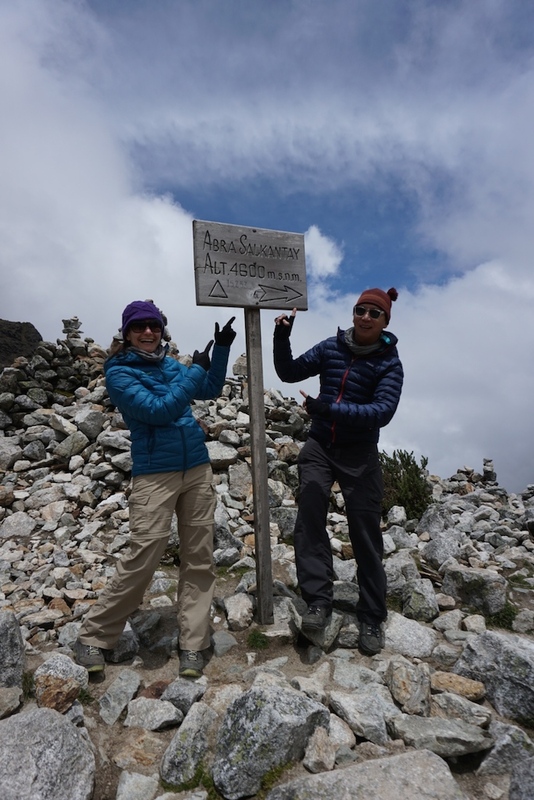 J and I skipped the last stop, and while other passengers were wandering around we used what little cell network we could get to find a travel agency offering the five-day Salkantay Trek. I called agency after agency until finally finding one that had a trek starting the next day -- and they had just two of 12 spots remaining! We still had more than an hour to go by bus and needed to arrive to the office of Salkantay Trekking company in Cusco to guarantee our spot immediately. Somehow the stars aligned, and after the quickest possible hotel check-in and hitting the bank to get cash for the trek, we made it to the office, paid the fee and joined the briefing held the night before a trek along with the other 10 travelers. The tour guide, Eleasar, provided general info and timing regarding what we should all expect. I found it odd that he did not prompt introductions among the hikers that night, and indeed did little throughout the following days to foster a group atmosphere. We left the briefing, ran a couple of errands, ate dinner and went to bed after packing, leaving only a few hours before waking at 4am to be picked up for the long drive to the trailhead. Our new friend Michy took us to Sillustani, a ruin about 45 minutes from Puno. Along the way, we stopped to give this Quechuan woman a ride. Llama pelts stacked near the ruin of Sillustani. We asked how much the pelt from one animal costs (each one is quite large, about 3 ft x 5 ft). The answer: 2 soles, or about 70 cents. E, J and Michy in front of the funerary tower at Sillustani. 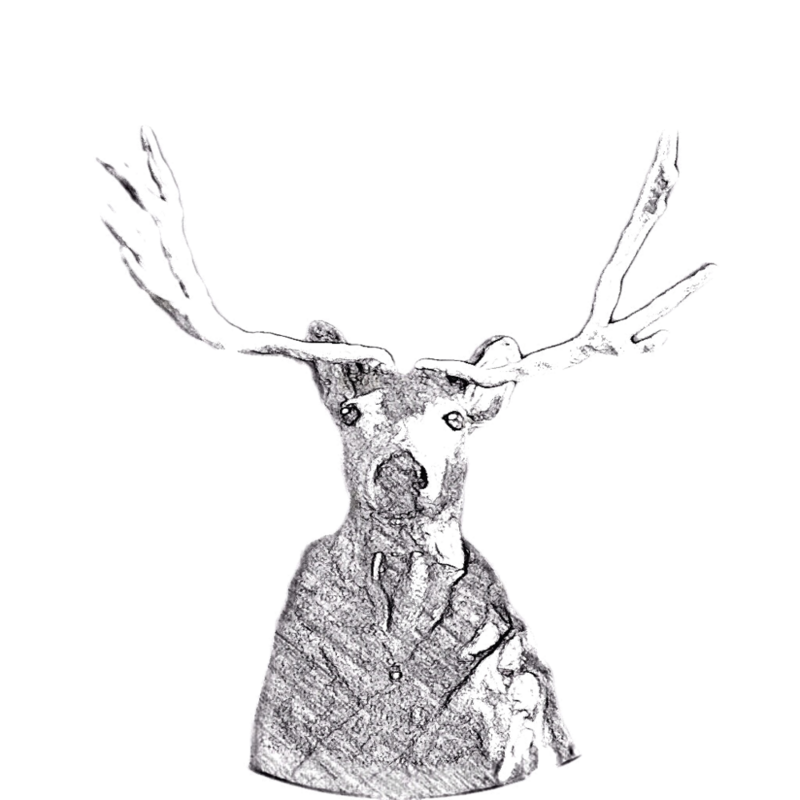 A partly mummified remain from the high Andes. The celebration for the Fiesta de la Virgen de Candelaria getting underway at the central plaza of Puno, near the shore of Lake Titicaca. Street painting in Puno on the eve of the Fiesta. 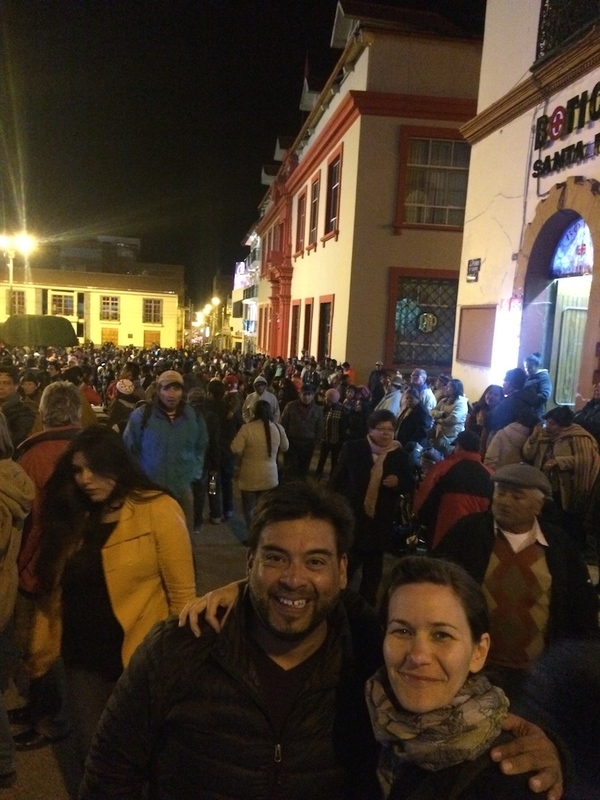 E and Michy enjoying the ruckus on the eve of the Fiesta in Puno. One of the floating islands of Uros on Lake Titicaca, 12,500'. A small resident of the Uros Islands with her dog. 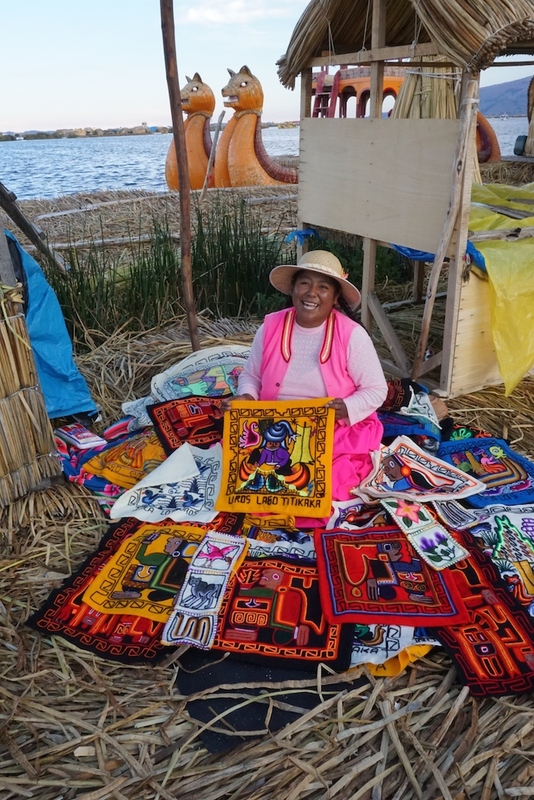 Carmen, our host on the floating island, and her wares. A dramatic sunset on one of the Uros Islands. Kids on an island playing ball at sunset as seen from our boat. A streetview in Puno, where traditional dress and heritage mix with more Westernized descendants of those colonized by the Spaniards. We couldn't resist this photo opp at a bus stop between Puno and Cusco. A vendor at a bus stop on the way between Puno and Cusco. Not a bad office view. Natasja Amsterdam of Holland. Spends two-thirds of every year living abroad in various parts of the globe. Lived over a decade in Bangladesh. Francis Molloy of Auckland, New Zealand. Four months into a 12-month journey through the Americas from Antarctica to the Arctic. Charlotte Fünning of Germany. Eighteen-year-old day care volunteer in Lima who will be applying to medical school upon returning home. John Yttenberg of Vail, Colorado. Ski instructor, lover of music and Kurt Cobain look-alike, per our guides. John Ardaugh of Chicago, Illinois. Traveling with friend John Y. Earned the trail name "Banana Man" on this trek. Charlie Beckman of the US. Helen McCurrie and Remy Horne of Cape Town, South Africa. Newlyweds who will be relocating to London soon. Becca and Stephen Turney of Nashville, Tennessee. A nurse and sound engineer respectively. Over the following days we all learned what a serendipitously perfect group this was. So many good conversations, jokes and songs were shared over many miles of trail and over well-earned, generously-portioned meals. I can say without a doubt that this byproduct of travel -- simple connection with other curious, open-hearted souls also bitten by wanderlust -- was the most cherished part of a trip also otherwise filled with daily wonder. By now, having traveled a great deal and met many interesting people, I know not to expect continued connection but rather enjoy the connection as it manifests in happenstance. But I do hope to be able to sustain contact with at least some of our new friends. The trek offered incredible variety. J and I were awe-struck by the beauty of the high Andes, making it to the highest point we had every reached on foot. The jungle villages we visited were another kind of fascinating. Interesting vegetation, simple living, and so many domesticated animals to greet hikers! 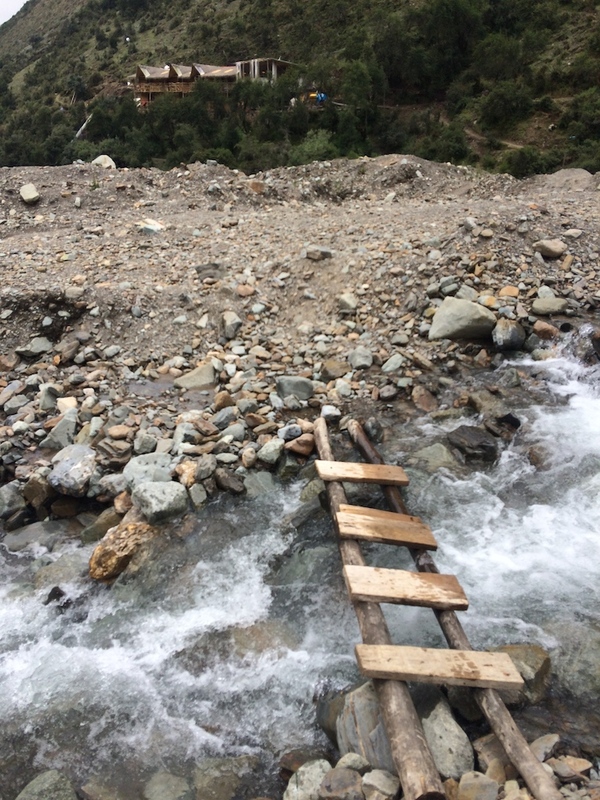 Here's what each day of the trek offered. Day 1 After the long drive, breakfast in a small village and a final check to ensure everyone had what they needed in their day packs, it was finally time to start hiking. After a few hours' hiking through jungle vegetation and past ancient Inca waterways, we arrived at our camping location in a breathtaking valley flanked by mountains and glaciers and inhabited mostly by horses, "mountain cows" (as our guide called them) and donkeys, all seemingly unimpressed by the views. We hiked up a steep trail to Lake Humantay at 4,200m/13,779ft, which is fed by a dying glacier of the same name. 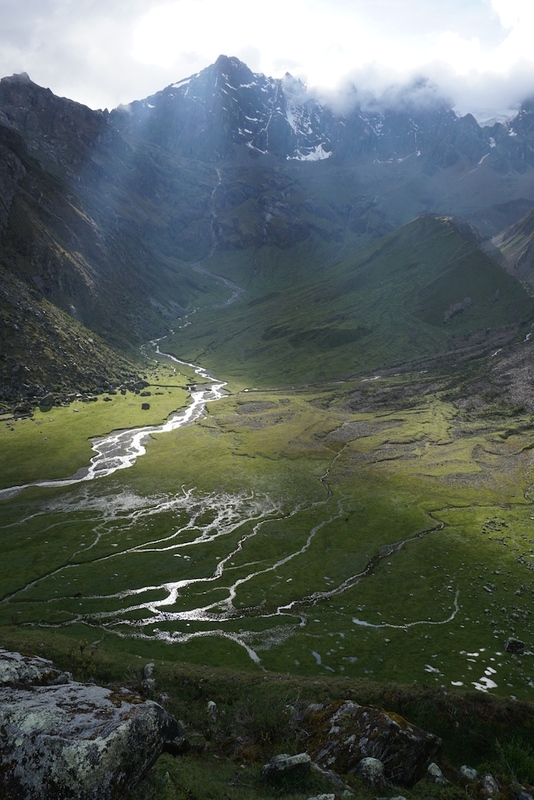 Not long ago, the entirety of the valley above it was sealed by an ancient glacier. Standing at the lake's shore, we looked up some 200 feet to see clear glacial scarring. Behind us was a wall of earth and rocks left by its terminal moraine, a grim reminder that our planet is quickly changing. That night we slept in a glass "igloo" large enough to accommodate two people, one of 10 igloos lined up in a row. Day 2 With a healthy ascent to start the day, we reached the trek's high point at Salkantay Pass at 4,630m/15,190ft, higher than our feet had ever taken us before. 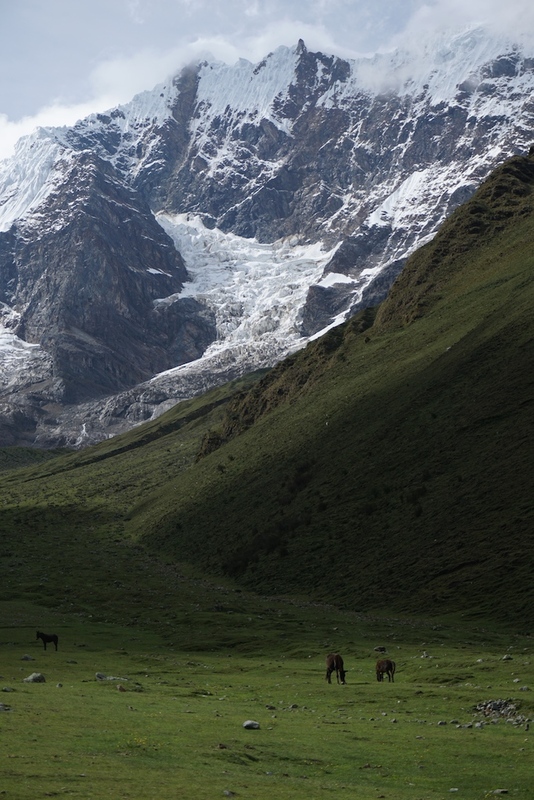 The pass is dwarfed by Salkantay Peak, which at 6,254m/20,550ft is the highest in the Vilcabamba Range of the Andes. National Geographic Adventure magazine named the Salkantay Trek as one of the 25 best treks in the world. It certainly was one of our 25 best! Day 3 We walked along dirt roads through the jungle much of the day because heavy rain the night before had rendered the trails potentially dangerous. 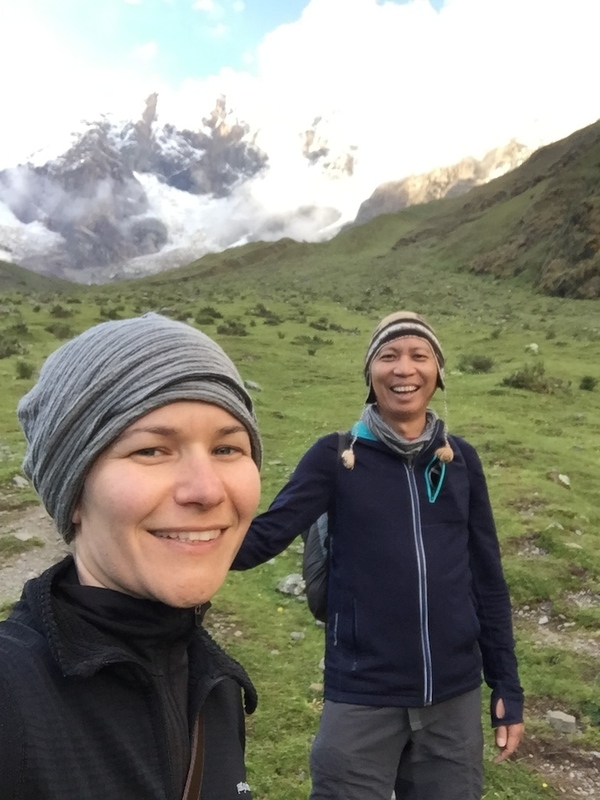 One of the upsides was that walking the road made for a convivial time for our group, as conversation came more easily than when climbing or descending a single-track trail at higher elevations. Along the way, we stopped for a break where a colorfully-dressed woman with a baby on her back was selling passion fruit and bananas she and her family grew a steep 10-minute walk down the canyon and across the river. The passion fruit was the best we've ever tasted...and not just because she was selling two for one sol (about $0.30)! Day 4 After three days spent in the high Andes and down in jungle villages where coffee, bananas, avocado and guavas grow, on day 4 we spent hours walking along the train tracks to Aguas Calientes (aka "Machu Picchu town"). In all, we covered some 22 miles, sometimes under intensely humid heat, followed by a cool rain. We arrived at Aguas Calientes and met with our friends Christine and James, our Utah buds who invited us to Perú in the first place. They had just flown in a couple of days before. Our gleeful reunion was short and sweet -- as we all had much preparation for the following day. Day 5 We awoke before 4am to rendezvous with our hiking buddies and begin the pilgrimage to the Inca citadel. Aguas Calientes was already buzzing with other early risers intent on hiking up or catching the first shuttle buses to beat the crowds. "Beating the crowds" is a relative concept, even in the low season -- and by shortly past 5am our ascent had begun along that of several hundred others. It's a grueling climb in the dark, with heat and humidity already bearing down as we headed closer to Machu Picchu. About an hour later we finally arrived to the entrance. We wandered around for a few hours, and then hiked up Huayna Picchu, the iconic mountain often pictured just behind the citadel. The hike is accomplished via up steep stairways clearly not made for feet wearing large hiking boots. We spent the rest of the day with Francis, Christine, James, and their boss/friend Rebecca, wandering through serpentine corridors, spying window views to the stunning mountains surrounding the site, communing with llamas as they tried assertively to claim our lunches, and finding nooks and crannies to rest and take it all in. 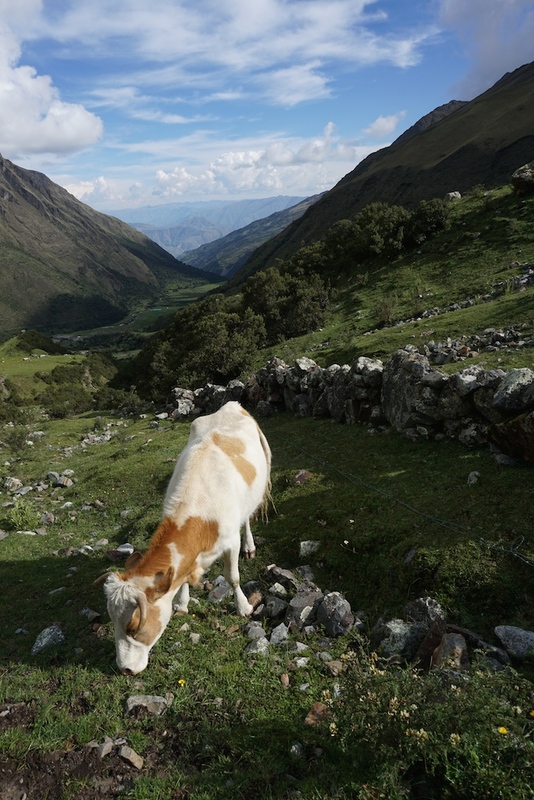 The Salkantay Trek was one of the top highlights -- if not the top highlight -- of our trip. Click to see a GPS map our adventure. Steep, weather-beaten 19,000-foot peak above Humantay Lake. Ancient Inca waterway along the Salkantay Trail. Our guide shared that about 40% of the waterways were retrofitted in modern times, but the remaining 60% are original. Atop a ridge between Humantay Lake and a verdant valley. Said verdant valley. It was even more gorgeous than the photo, if you can believe that. Our intrepid group of Salkantay trekkers on the shore of Humantay Lake. One of several iffy bridges on the trail. We slept in a glass igloo the first night, the door for which was clearly constructed for a 2-foot-tall hobbit. The dining room the first night's camp. Our guide sharing knowledge with our weary group at Salkantay Pass. After spending the first two days in the high Andes we descended into the jungle. One of our guides, Oscar, made finger paint with berries from the trees, which he then offered to apply to our faces "the way the Inca warriors did." A fruit vendor selling passion fruit and bananas she grows down a steep path and next to the river. After hours of hiking in the rain in the morning, we were pleasantly surprised that our crew had been cooking up a feast for lunch, which was served in this hut. It was one of many gargantuan meals we had, and it was particularly difficult to leave because we were going back out into the cold, pouring rain. Adorable resident kittens hanging out underneath the lunch table. That night we slept in a jungle village. Our guides expected rain that night so we all slept on a second-floor deck while the family that oversees the property slept in a small room below (which we could see from this store window). With items such as beer and toilet paper for sale, we felt rather spoiled. View of the jungle behind an ever-present shroud of clouds. 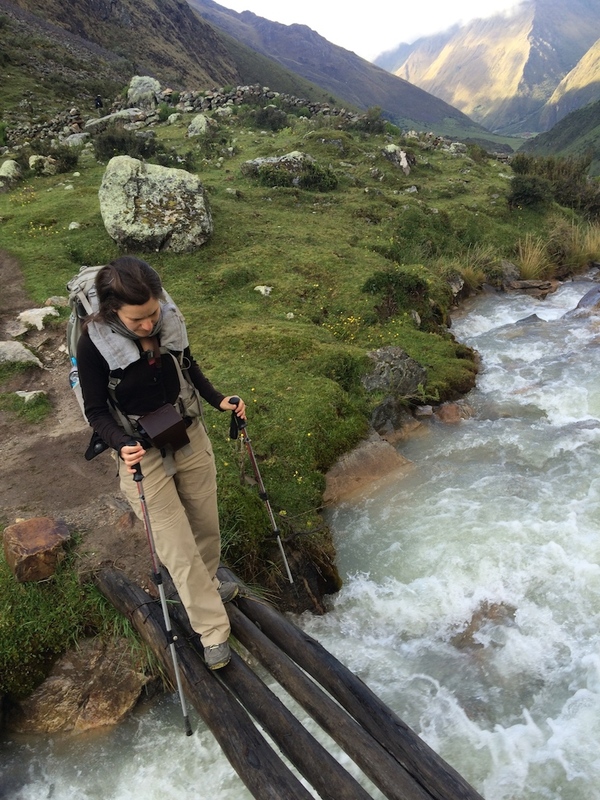 The walk to Aguas Calientes ("Machu Picchu town") on day 4 was lengthy. It was hot and humid. One of the friendlier jungle residents. More residents of the jungle. Lunch on day 4 was in a resort-like space complete with hammocks, very cute cats and excellent shade-grown coffee. We had our best cup of coffee in Peru here. Not so cute was this sight just outside of the entrance to the resort -- a mama duck and her ducklings visiting a trashed puddle in the road. On day 5, we reached the final destination after a steep and steady climb up and untold number of steps. Nevermind that most people just take a bus from Aguas Calientes. 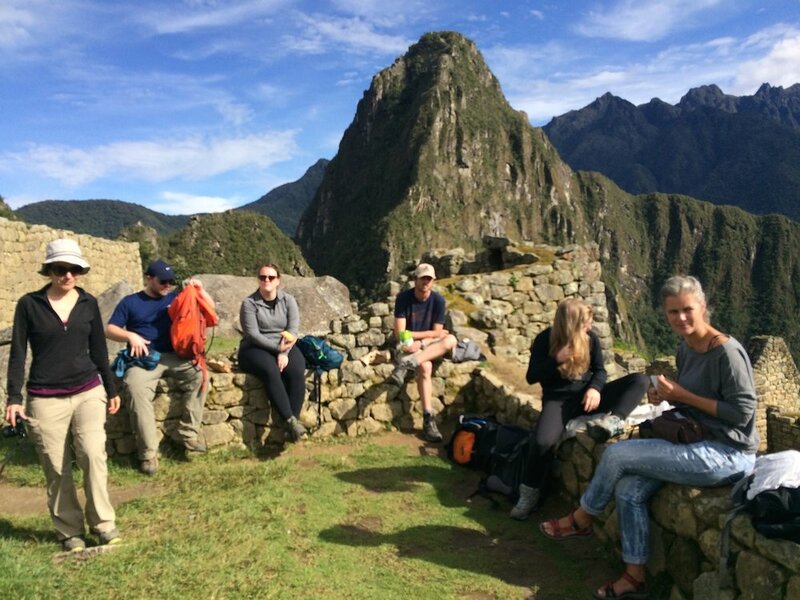 There's really no such thing as a bad lunch spot at Machu Picchu. The day after our visit to Machu Picchu James, Christine, Rebecca, J and I took the train to Ollantaytambo in the Sacred Valley (the only way to/from Aguas Calientes is by train or on foot) . 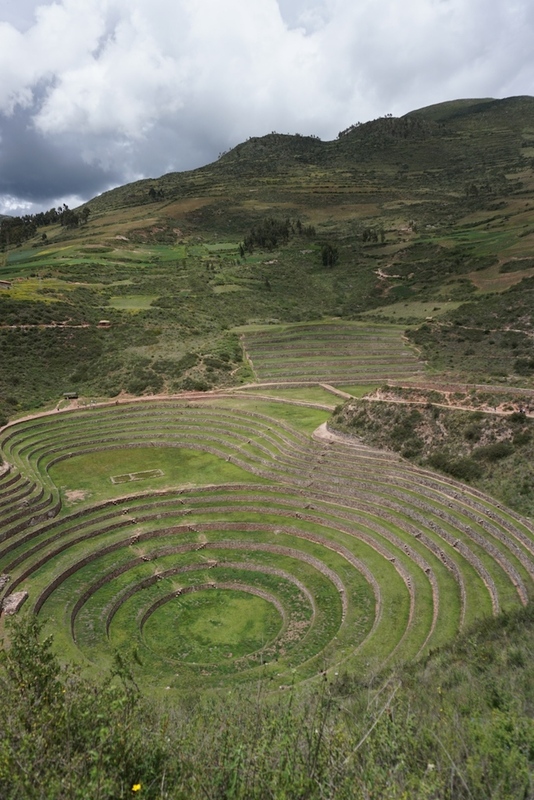 We spent a day and a half exploring the relative tranquility of the Valley, visiting the salt ponds of Maras, the circular terraces Moray and the ruins of Ollantaytambo. 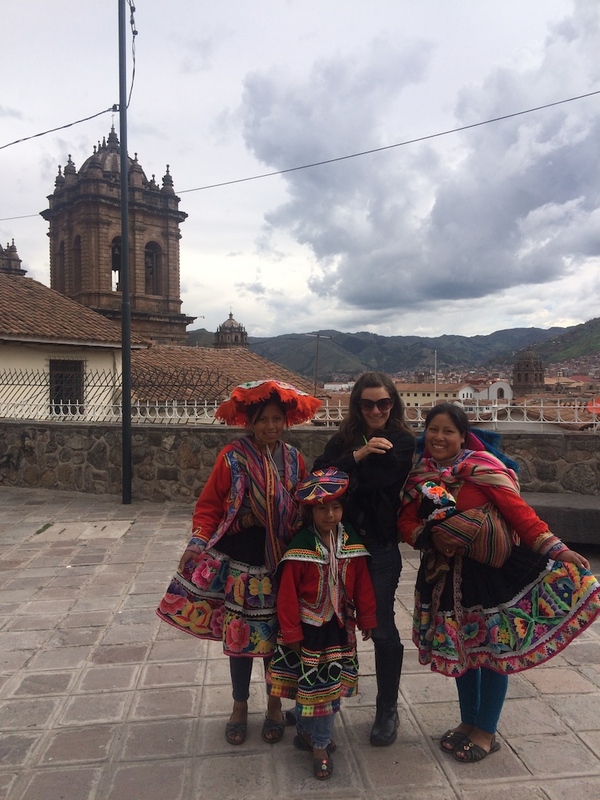 We then split with Rebecca (who stayed on in the Sacred Valley) and the four of us headed to the ancient capital of Cusco, where we spent a couple of days taking in the city's museums, ruins and cobble-stoned streets. We stayed in the neighborhood of San Blas, which offered a perfect place from which to explore the historic city center, the ruins of Sacsayhuaman, and the endless number of tiny streets and passageways criss-crossing the city. The following day was our last in the country and was my birthday. 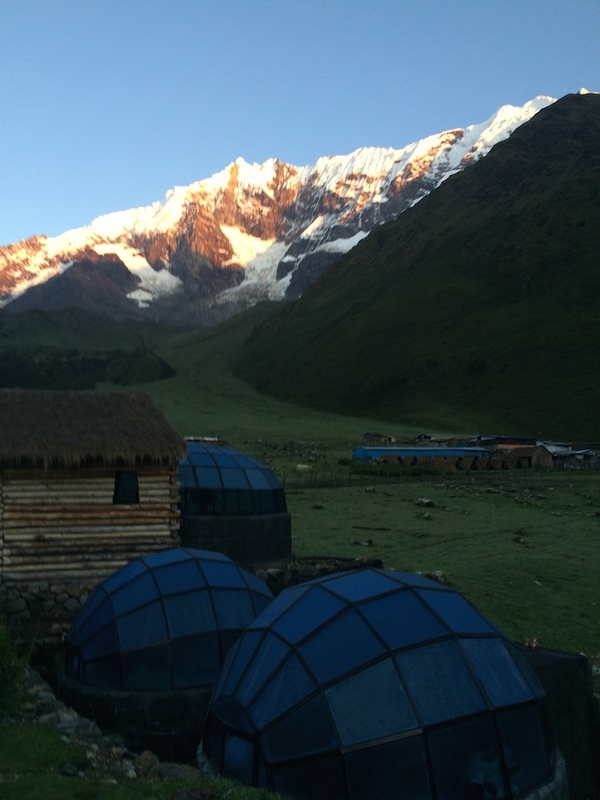 We once again awoke at the ungodly hour of 4am, this time to hike Vinicunca Mountain (aka Rainbow Mountain). Though only recently "discovered" for tourism, we were struck by just how many hikers, guides, local vendors and horsemen (and horsewomen and children) there were. The namesake mountain pass is about 5 miles from the trailhead -- not a long distance, but boy are you humbled by the elevation, which tops out at 16,520ft/5,035m! This broke our previous week's elevation record and was, for the record, the most exhausting hiking I've ever done. From the top, we were satiated by views of the gorgeous Ausangate glacier, which at 20,945ft/6,385m is the highest mountain in the Cusco region. We were the only group to take a longer return route on the way back, via a neighboring "red canyon" composed of soft scree, an idyllic (but boggy) riparian valley, and steep, fertile terraces planted with rows of colorful potato crops. The sights were absolutely remarkable. We then proceeded to have a mutiny when our guide's incompetence came through and he had to rely on my map and GPS receiver to attempt to lead eight of us back via the alternate route -- a route which he had apparently had never attempted before. It was a trying experience, but fortunately the terrain and vistas more than made up for it. 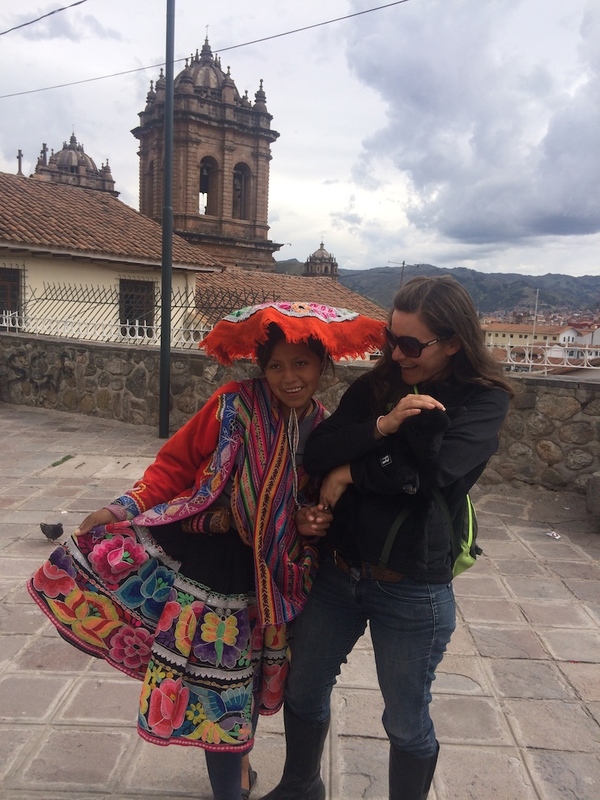 Along the way, I communicated with a local woman who spoke only Quechua; somehow we understood each other and she proved to be very helpful, far more so than our guide! In all, my GPS recorded an 18.7-mile hike that day, which means our return trip ("shorter than the hike in," according to our guide) was nearly 14 miles long. Here's a map of our adventure from our trusty Garmin GPS. We got back late and in the pouring rain, but we nevertheless mustered enough energy for our group to go out for a delicious birthday dinner at Cicciolina in Cusco's historic district. It was a great bookend to a perspective-altering trip. We said good night to our friends, and were up early the next morning to catch a three-leg, 17-hour flight home from Cusco to Lima to Panama City to Los Angeles. A young resident in traditional costume, Ollantaytambo. The travelers sporting fashionable disposable ponchos in Ollantaytambo. A resident of the ruins at Ollantaytambo. The famous 12-sided stone of Cusco. The peddler guarding it claimed it is more famous than Michael Jackson. Jesus Blanco watching over Cusco. 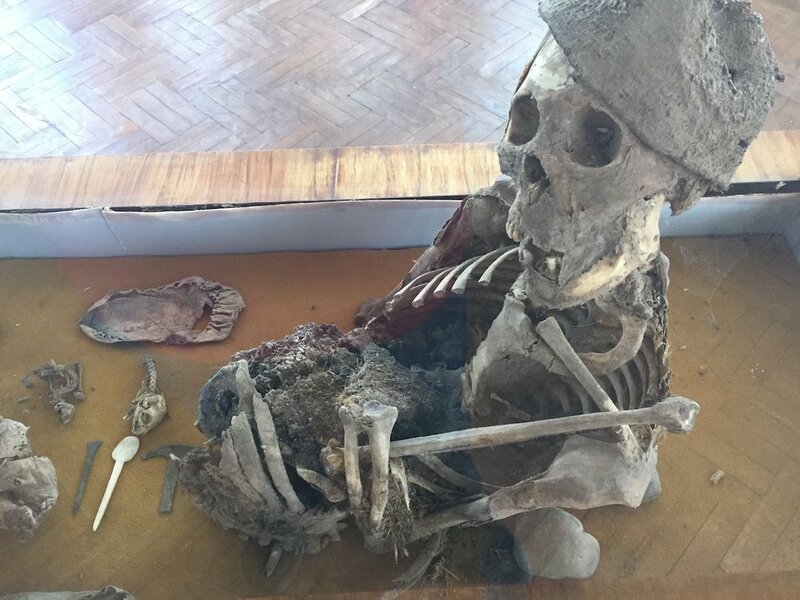 Mummies in one of Cusco's many museums. The poorest village we visited on the trip was Japura, the site where our group stopped for breakfast and lunch on our way to/from Rainbow Mountain. A family opened their home to us to feed us. This was the dining room. Two village children in Japura. Highland dwellers ready to rescue weary hikers with a horse rental. The destination, Rainbow Mountain, at over 16,500'. If the view doesn't take your breath away, the elevation will. We took a different route back, via "red canyon." As we followed the ridge away from Rainbow Mountain a snowy thunderstorm formed above us. Our intrepid group who chose to take the much longer route back included the four of us, two Russians, a Bulgarian and a Peruvian. We encountered this dog, who joined us for part of the hike. Potato crops planted in terraces in the steep slopes of the canyon. 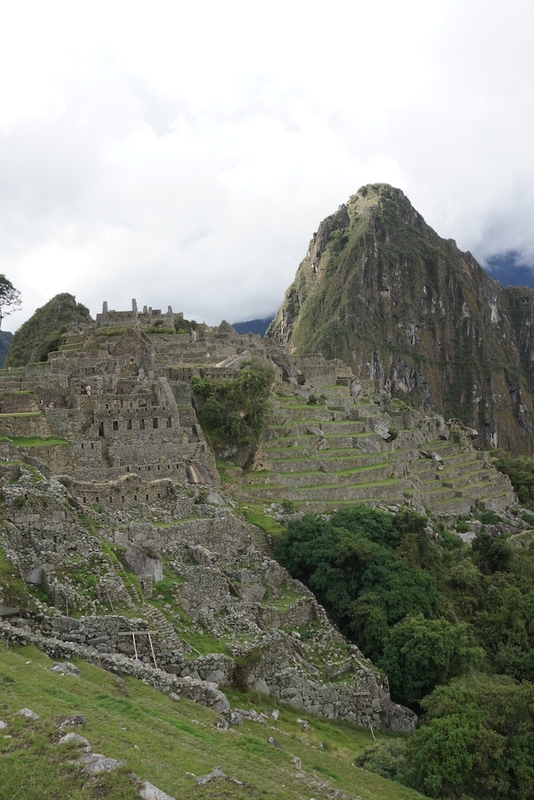 The unlikely combination of cultural history, natural splendor and the human element makes Perú and incredibly rich and interesting place to experience. 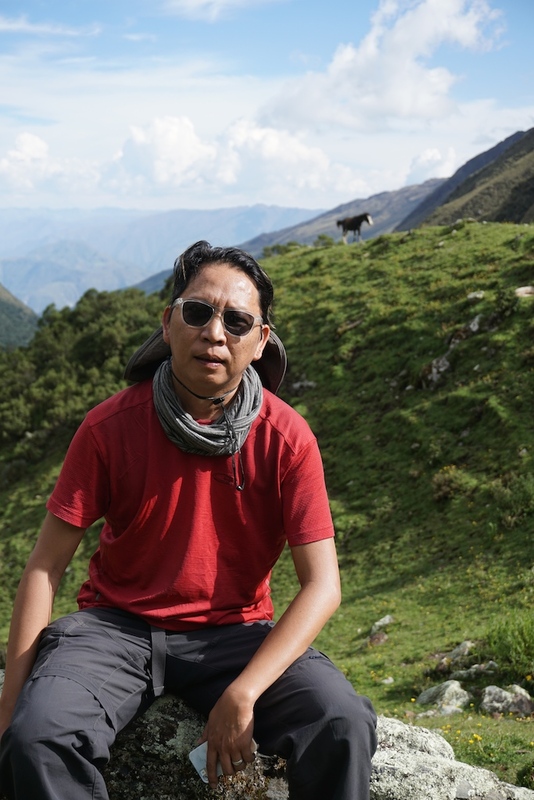 Despite being my first longer-term visit to a developing country, I found it easy to slip into the reality of Peruvian life as it exists for much of the population. I expected some culture shock but didn't end up experiencing it in any significant way. Instead, I found myself drawn to how the elemental existence of life manifests irrespective of time, place and, perhaps, material wealth. I'm hungry to explore other parts of Latin America! I wish I hadn't felt the ever-present propensity of many Peruvians dealing with tourists to swindle said tourists. It was exhausting and marred an otherwise enriching two and a half weeks. Many Peruvians sleep very little. We witnessed late-night partying and waking up exceedingly early over and over again. Food is most often excellent, and portions are monstrous. Western privilege is palpable, and the lack of environmental and public health protections in Perú make for an eye-popping disparity between this country and the developed world. This is the one area where my mind and heart protest the way things are in Perú. Travel of any kind is so essential to the heart and mind; international travel is even more so!